This book sounds right up my alley! I have to read it. Thanks so much for reviewing it and bringing it to my (I know there are others :-)) attention. Nora Roberts is hit or miss for me - glad to see this is a good one. I've got the first two books in this trilogy but not the third yet. I'm glad to hear that it's good. 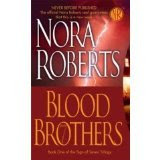 I have run into some Nora Roberts books that I didn't enjoy because of repetitive plot lines but I never seem to have that problem with her series books. Ever one of those I've read, I've loved. Really want to get around to reading these!